Poetry Sharing Event: It’s a Wrap! Still tuned in? The last ten days have been busy with the Poetry Sharing Event submissions and your feedback. I hope you found some poems that spoke to you. These Sunshine Award nominations were made possible by theparasiteguy.wordpress.com. Thank you so much! 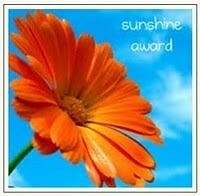 The Sunshine Award is for bloggers who brighten people’s lives. Now, only people with blogs can be nominated for the Sunshine Award, but there are a few poets without blogs who deserve an honorary nomination for their hard work and bravery. Their names follow the actual nominees. 1) Post the Sunshine Award logo. 2) Accept the nomination and link back to the nominator. 3) Nominate ten other blogs and inform them of the nomination. My Favorite Alcoholic Beverage: I actually don’t drink at all. And not because I’m a snob. I don’t like the taste. Giving or Receiving Gifts: I love to give gifts. My favorite part of this award is the nominating of 10 people for the award. I like that part so much I’m nominating more than 10 people. Favorite City: Huntsville, Alabama with its city built above a cave system, right by the Tennessee River and Wheeler Wildlife Refuge. What city could be more perfect? Favorite TV Shows: I don’t watch live television alone because I can’t recognize faces or many facial expressions so I get lost. I do like anime (in Japanese with English subtitles) which is easier for me to follow. Thank you so much for this nomination, which I happily accept! My Passions: writing poetry, preparing international cuisine, discovering new things. Giving or Receiving Gifts: Giving gifts reminds me how fortunate I am. My favorite part of this award is the recognition, of course, and having the opportunity to nominate and encourage other writers. Favorite City: Fecamp, France, where the air is crisp and clean, the food is luscious, and the people are wonderfully friendly. Also, how do I nominate 10 other bloggers? I am very new to this site. You do the steps on your blog. You nominate a person in three steps. First you choose any ten bloggers you want (you don’t have to host an event like I did). Next, post their user names and a link to their blog. Finally, let them know they have been nominated. Have fun! Done! Thank you again for this opportunity, and for the Sunshine Award nomination.